Women's Equality Day is August 26th, and here at Seva that's a day worth celebrating. Although we are first and foremost an eye care organization, promoting gender equity is also one of our top priorities. And for good reason. Women and girls in developing countries face even higher barriers to eye care than do their male counterparts. Seva also plays a key role in expanding economic opportunity for women by offering a range of jobs for which a medical degree is not required. As you'll see in this e-newsletter's featured video, women are trained to serve as ophthalmic assistants, community health workers, and counselors. These are critical jobs that greatly expand our ability to treat as many people in need as possible, provide a leg up for the women who do this work and might otherwise be confined to a life with few possibilities, and infuse new dollars into regions with limited economic opportunity. The principle that underpins our push toward gender equity echoes throughout Seva's work around the world. Through the mentor-mentee approach that defines our Global Sight Initiative, entire eye care systems learn to function more efficiently and to use the resources available to them to maximum capacity. Whether we're working at the system level or focusing on the outcomes for individual workers and patients, Seva's approach is always true to the meaning of our name: selfless service. Every day, we put our compassion into action, and move one step closer to a future free from avoidable blindness. 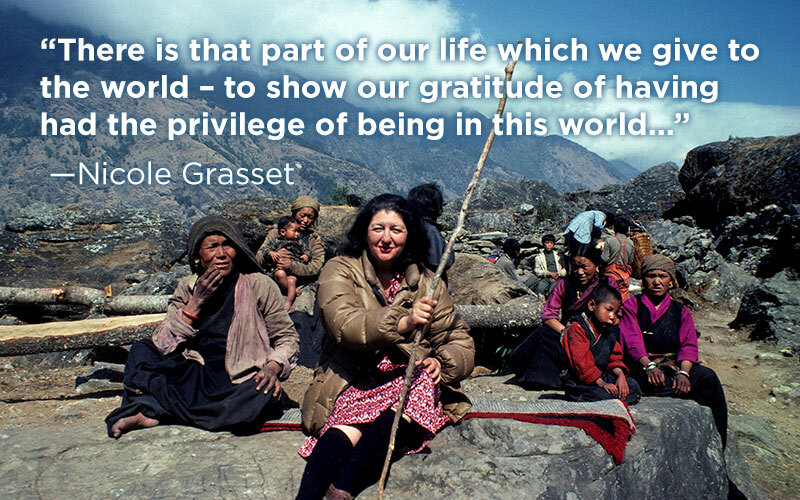 Above: Dr Nicole Grasset (1927-2009), public health pioneer and Seva co-founder, when she was in Nepal. After working on smallpox eradication with people like Larry Brilliant, Grasset went on to serve as a founder of Seva Foundation.